My tweets are like a two line blog accompanied by charts. Today I only intended to comment on the January Barometer and the December low indicator. It was supposed to be a short blog update. I like tweets as I’m limited to the length of my comments and they take little time to compose. Quote from “Stock Traders Almanac 2014”. The SP 500 closed January with a negative 65.77 points or a 3.56% loss. On Wednesday, Jan 29 the Dow Industrials closed at 15738.79. This was the first violation of the December low. On Friday, Jan 31st, the Dow Industrials closed at 15698.85 for the second violation of the December low. Obviously the December low warning is in effect. I came across this chart this morning and had to pass it along. 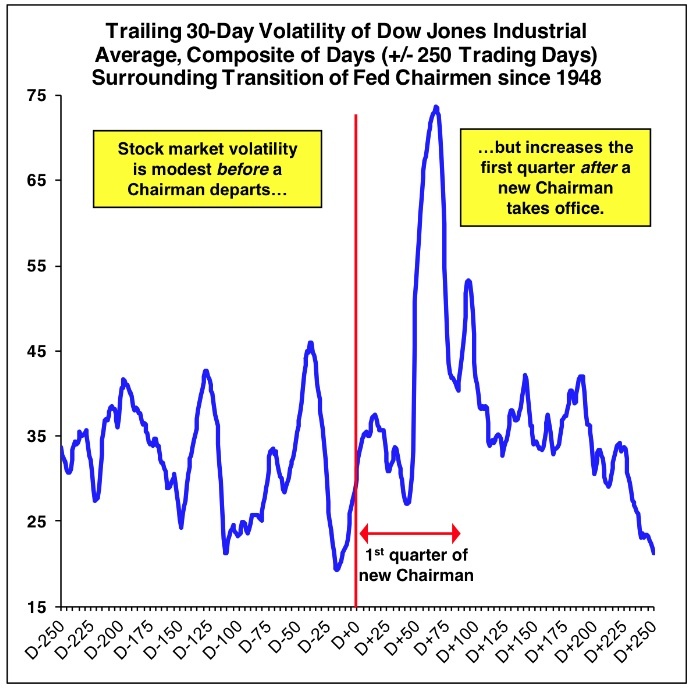 It shows that volatility increases significantly during the early days of a new Fed Chairmans’s term. One of the best examples of this was the beginning of Greenspan’s term, which began in August 1987 and was followed by the October crash in 1987. For those that have been hiding in a cave, we have a new FED chairman (chairwoman). She takes Bernanke’s job beginning today (February 1). Certainly caution is warranted here as I have been saying for some time. I get very skittish in the later stages of a large step 3 and I realize that much of the time, it’s unwarranted and ill-timed. It’s an excellent example of Chicken Little. Knowing the potential of what may be coming makes me over cautious. I have more fun in the earlier stages of a bull market, when the snap back from the bear market bottom can be breath taking. This makes up most of step 1. Step 2 can be a fun time also. Step 3 can have good beginnings, which can be followed by saw tooth peaks. Many stocks will peak and begin their decline during this saw-tooth process. That is not taking place at the present. Certainly ignorance can be bliss because some very good returns can take place during step 3. This is precisely what we have witnessed over the past year. 1998 to 2000 was a classic example. Usually these gains are lost by the typical investor because he doesn’t know when to take his profits and run. Normally in large step 3 the typical investor is in a “buy the dip” mode and although this mode is correct for awhile, this mentality will remain well past the peak causing losses to mount ever higher. If it was easy making money on Wall Street, everyone would be rich. I liked Bernard Baruch’s comments who said in effect that he always buys too late and sells too early. I don’t normally buy too late, but I do sell too early. In the latter stages of large step 3, I am no longer in investor mode, but have transitioned into trader mode. I begin bull markets in the opposite fashion as I am in trader mode (left over from the bear market) and transition into investor mode as a portion of my shorter term trades remain in my portfolio. See MONEY MANAGEMENT (BRESSERT’S SYSTEM) in Wave Counting & Concept Glossary The concepts are alphabetical and it falls under the Ms. Presently the market is moderately oversold and should see more of a bounce. The only caveat to that statement is that the market “could” become more oversold. Overbought and oversold, much like sentiment is a “relative” indicator. Jeff Saut has turned cautious, but appears to not be in the bear camp. His Monday comments should reveal more detail. In my opinion, I think he is waiting for a Dow Theory sell signal, which he says won’t take place unless we violate the June 2013 lows. Looking at the Dow Industrials during the June to October time frame, we had a 3 step decline that didn’t really appear on any of the other averages. See the next chart. We don’t really have a saw-tooth top that should be present for a major turn to take place. Only a major accident that takes Wall Street by surprise could cause a sudden turn in a bull market. Those events don’t take place as the Street seems to know far more than we do. We find out the facts far too late. That’s how the axiom was born to “buy the rumor and sell the news”. The next chart shows the last 14 months for a few indexes. After clicking on this chart, set your viewer to 100% or actual size. What does the future look like??? It would not be surprising to see the market have more decline and then return to the area of its previous all-time highs. Whether we make new highs is debatable, but it could mark the last gasp of a dying bull market. This could be the last tooth of a saw-tooth top. We’ll see how this works out later. In 2007, we had a market break beginning in July 2007 followed by a rally to new all time highs for the Dow Industrials in October 2007. This last rally had terrible internals and was not confirmed by many indexes. The next chart shows how 2007 formed its peak. Prior to the July decline in that market, 2007 looked much like 2013. See the second chart following. As I have pointed out previously the late February 2007 market break was the first decline where Wall Street began to understand the banking problems that were coming. Only if you were watching and listening closely would you have caught the meaning of that decline. The following is SPX 2013 to the present. Good trading to all and have a prosperous year in 2014. This entry was posted on February 1, 2014 at 12:06 PM and is filed under UPDATE. You can subscribe via RSS 2.0 feed to this post's comments. You can comment below, or link to this permanent URL from your own site. Bob watching the $tick on your ADX chart- below the green line looks like a buy? Also there is a small gap at 1732 (Oct) which is now the lower end of the keltner band. Thanks very much, Bob! Really appreciate your analysis.